The newly released Toyota Camry Hybrid has scored an impressive motoring trifecta with boosts to power, economy and value when compared to the previous model. As the flagship of the seventh-generation Camry range, the hybrid sedans deliver a power surge of 7.8 per cent over their predecessors, with a fuel-economy improvement of up to 17 per cent on the city cycle. Toyota Camry Hybrid now has more equipment and enhanced styling, aerodynamics, interior space, safety, ride comfort, handling and luggage space. Despite the significant advances, the starting price for the entry-level Camry H has been lowered to $34,990* - a reduction of $2,000 or 5.4 per cent. Value has also been enhanced for high-grade Camry HL at $41,490* with equipment gains of at least $4,500 for a price rise of just $1,500. Toyota Australia's executive director sales and marketing Matthew Callachor said the new Camry Hybrid demonstrated the benefits of Toyota's long history with petrol-electric hybrid vehicles. "New Camry Hybrid is a leap forward in performance, refinement and efficiency," Mr Callachor said. "Our flagship hybrid sedan is in a class of its own, with an unrivalled combination of spirited power and seamless acceleration while using substantially less fuel." "We expect all these benefits - in addition to the noticeable enhancements to styling, dynamics and value - to increase sales of Camry Hybrid in Australia." The new Camry Hybrid debuts a highly revised version of Toyota's Hybrid Synergy Drive powertrain, including a new 2.5-litre four-cylinder petrol engine and a high-torque electric motor. The system's combined output has been lifted to 151 kW (from 140 kW) with power varied between the petrol engine and electric motor, or combined as needed. The new 2.5-litre engine, like the 2.4-litre it replaces, uses the Atkinson cycle to achieve maximum efficiency while producing more power and torque than the previous engine. Camry Hybrid's already thrifty fuel consumption tumbles approximately 17.4 per cent further in the city to just 5.7 litres/100 km (down from 6.9 litres/100 km) - substantially better than the best-selling mid-size diesel rivals as well as smaller diesel-powered cars. On the highway, fuel use drops approximately half a litre to 4.9 litres/100 km (down from 5.4 litres/100 km) while the combined fuel-economy figure improves to 5.2 litres/100 km (down from 6.0 litres/100 km). Carbon-dioxide emissions have been cut to 121 grammes/km from 142 grammes/km. 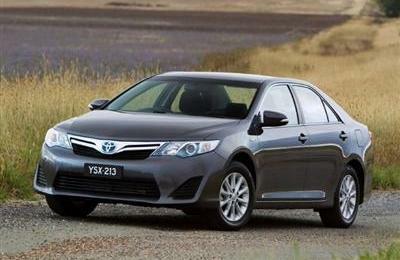 Camry Hybrid uses one-third less fuel on the combined cycle than the already efficient petrol-fuelled Camry. With fuel at $1.50 a litre, that would translate into fuel savings of $2,340 over three years for someone travelling 20,000km a year. Exclusive exterior and interior designs and badges differentiate the Camry Hybrid from other Camry models. An exclusive radiator grille with a chrome upper section and a "hybrid blue" Toyota badge is flanked by headlights with blue-accented extensions. The rear design expresses a solid stance and a wide feel, featuring the hybrid blue Toyota badge and, for the HL grade, a bootlid spoiler and chrome garnish. Inside, there are refined touches with attention to detail, including soft-touch padding, quality stitching and a three-dial Optitron instrument panel with chrome-accented outer rings and metallic-blue meter gradations. Hybrid-exclusive brushed silver inserts ornament the upper console panels, door-switch bases and around the gear selector. Camry HL also features a brushed silver shift knob. A comprehensive safety package includes stability and traction control, anti-lock brakes with brake assist and a reversing camera with the image displayed on a 6.1-inch touch-screen. There are now seven airbags with the inclusion of a driver's knee airbag plus seatbelt indicators for all five occupants. Camry Hybrid is even quieter than the petrol models with new sound-absorbing materials in the engine compartment in addition to its acoustic windscreen. The proven nickel-metal hydride battery, located in the boot behind the rear seats, now features enhanced air cooling. Its more compact size, along with moving the DC/DC converter to the engine bay, results in a boot that is more than eight per cent larger than the previous model. The new model has been engineered with a towing capacity of 300 kg - enough to provide owners with the flexibility to tow a small trailer. Depending on the battery's state of charge and certain other factors, EV drive mode may allow the driver to operate the car on the electric motor alone for up to 2 km at lower speeds (below approximately 45 km/h). An electric water pump, a roller-rocker type valvetrain and a variable-output oil pump boost economy by helping to reduce internal friction. A new water-cooled exhaust gas recirculation system helps to ensure low emissions at all vehicle speeds and helps increase fuel efficiency. Air-conditioning and power-steering systems are driven electrically. A lighter body and optimised aerodynamics contribute to better performance and fuel economy while lower rolling resistance tyres also boost fuel efficiency. ECO drive mode optimises throttle response and air-conditioning output to prioritise maximum fuel economy. The hybrid-exclusive instrument cluster has features that help the driver to operate the car as economically as possible. Instantaneous fuel economy is shown with LEDs (light-emitting diodes) around the outside of the average fuel-economy gauge. A hybrid system indicator included in the multi-information display can also show energy flow and cruising range information. Applying the brake converts the motor to a generator that captures the kinetic energy from the wheels, storing it in the hybrid battery pack. New hill-start assist control helps prevent the vehicle from rolling backwards when starting off on an incline when the brake pedal is released. 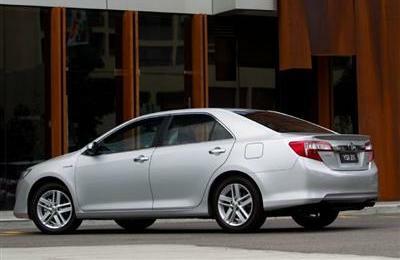 Camry Hybrid is offered in two grades - Camry H and Camry HL. Compared with the outgoing model, the Camry HL variant also gains a 10-speaker JBL premium audio system with a seven-inch touch-screen display, satellite navigation with live traffic updates (limited coverage), digital radio, 17-inch alloy wheels, an electric rear sunshade, exterior mirrors that dip when reversing and memory settings for the electric driver's seat. New Camry Hybrid is covered by Toyota Service Advantage with the cost of services capped at $130 for each of up to five services in the first four years or 75,000 km (whichever comes first) - identical to the petrol Camry range (excludes rental cars and government owned cars).